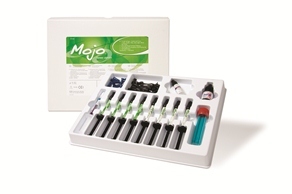 Mojo Veneer Cement is a light-cured esthetic resin cementation system that is designed for use with porcelain, ceramic and composite veneer restorations. Mojo Veneer Cement shades include Light, Dark, Clear, and Movie StarTM White, and each shade is complemented by a water-soluble, try-in gel that is designed to match perfectly to the cured cement. Mojo Veneer Cement shades can be mixed for customization to further “warm” or “brighten” the shade. Light cure Mojo Veneer Cement for 1-2 seconds to tack veneers in place while easily removing any excess cement (Figure 1). Once cement is removed, a final cement polymerization is achieved by light curing each surface for 20 seconds. Th e kit contains: four, 2.3 g cement syringes and four, 1.6 g try-in gel syringes; 4 mL bottle of Bond-1 primer/adhesive; 1 mL syringe of 37% phosphoric acid etching gel; 3 mL bottle of silane; 40 syringe tips; and manufacturer’s instructions. 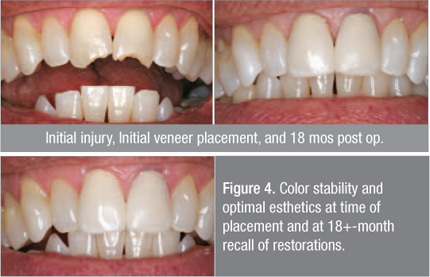 During the original evaluation, 25 clinical consultants use Mojo Veneer Cement to lute over 325 restorations. A total of 29 restorations were recalled over the past two years and are continuing to be monitored for clinical performance. 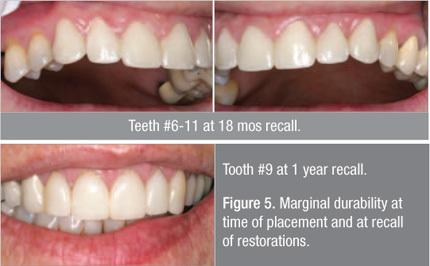 Restorations observed at recall ranged in age from less than six months to 2 years (Figure 2). Six criteria were evaluated at each recall and photographs were taken when available. 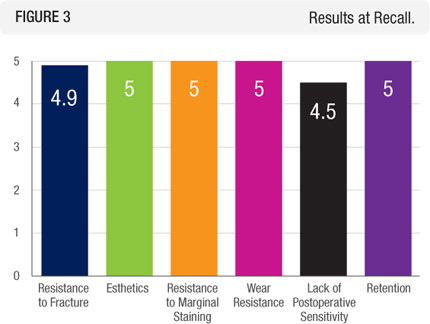 The categories evaluated were: resistance to fracture, esthetics, resistance to marginal discoloration, wear resistance, lack of postoperative sensitivity, and retention. Restorations were evaluated on a 1-5 rating scale: 1= poor, 2 = fair, 3 = good, 4 = very good, 5 = excellent. No marginal staining was observed over the two-year recall period (Figures 3 and 5). No marginal wear, ditching, or erosion were observed over the two-year recall period (Figure 3). 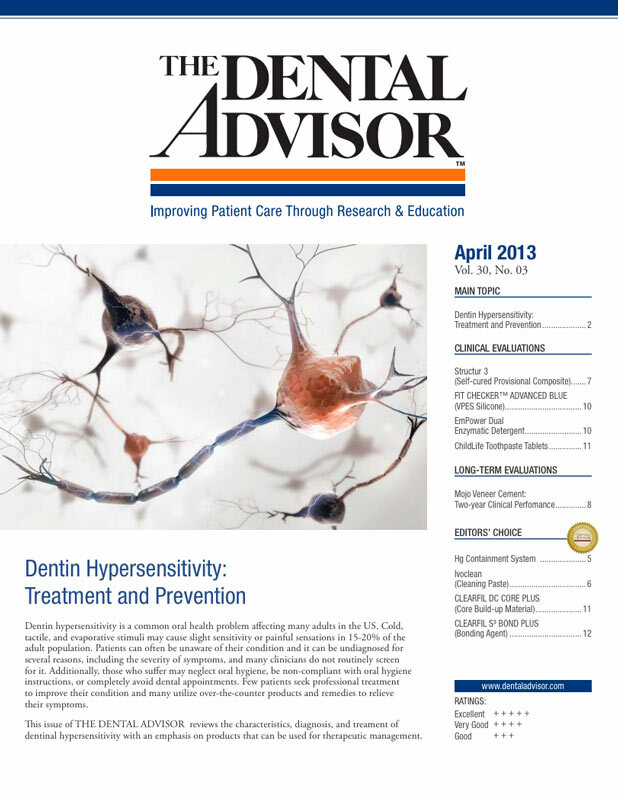 Of the restorations recalled, only two patients reported sensitivity following immediate placement of the restorations. This sensitivity was reported as “mild” and lasted two to three weeks. No long-term sensitivity was reported by any of the patients recalled and no restorations had to be removed for sensitivity (Figure 3). There were no debonds that occurred during the evaluation period (Figure 3). All consultants rated Mojo Veneer Cement as excellent. Of the 29 restorations tracked in this study, all of them received excellent ratings in all categories. 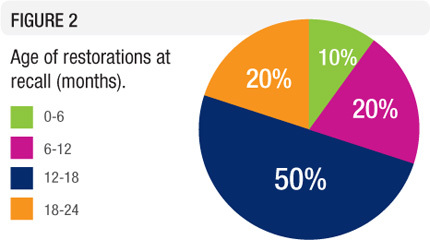 Of the over 325 restorations placed, there have been no reported debonds or clinical concerns. 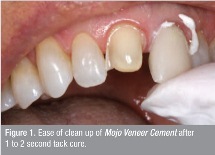 Mojo Veneer Cement is proving to be a top performing esthetic resin cement. It received at clinical rating of 98%.